Weight-Loss Hypnotist Coming to Town. Tempting . . .
I’ve actually signed up because I am deathly curious. I opted for the pay-at-the-door option, because of the very good chance I won’t show up. Part of me wants to believe there’d be some benefit, but I am the most skeptical person I know, and there are many other uses for the $60 cost for the two-hour session – fruits and veggies, especially, since I’ll be doing the vegetarian thing all next week. The dude that’s coming to town is part of Mark Patrick Seminars & Associates. I’m assuming Mark Patrick himself won’t be doing all the sessions, which are 2.5 hours long. There are impressive credentials and positive buzz from legitimate media outlets on the site. And hey, I’d get a CD, too. That’s good, right? What hooked me was the idea of having my sugar cravings quelled. Sugar is my drug of choice when stressed, or overtired, or a little sad. It would also be nice to be more committed to gym time. I’ve looked, but have not found hardly anything about this particular firm. Quite the opposite, actually. 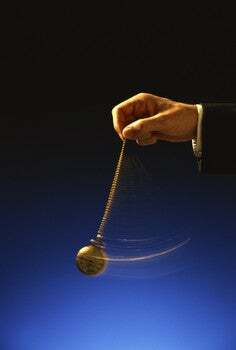 I’ve wanted to try hypnosis ever since watching a 2004 Dateline: NBC special called “Losing it: Dateline ultimate diet challenge.” There were six people trying six different methods of weight loss, and I remember that the one who underwent hypnosis had great results. He was with Boston hypnotherapist Tom Nicoli who, as far as I know, isn’t doing any tours. I was impressed, though, and have been thinking about it ever since. It looks like Nicoli’s weight-loss CDs are less expensive than the seminar. However, at least in the seminar, you can at least participate with a real person. I don’t know about just listening to a bunch of CDs. I admit, I’m deathly curious. I wonder if I can even be hypnotized. Knowing me, I would purposefully try to resist, just to prove it doesn’t work. Both Patrick and Nicoli offer money-back guarantees. So tempting. So very tempting. What do you think? If you, or anyone you know, has done any kind of hypnotherapy and would like to dish, please do so. I want to hear all about it. Meanwhile, I think I’ve just about talked myself out of going. The session I’d signed up for is on Tuesday afternoon, and I recently scheduled a meeting for the same time and day. Still, there are evening sessions, too. I’ll do more research. I would say it can’t hurt, but I’m not in the habit of throwing away $60. I mean, that would buy a lot of broccoli.